A brilliant new Lent Course for 2016, by the author of the acclaimed Christ and the Chocolaterie and Finding a Voice. Based on the Oscar-winning film The Theory of Everything, this course deals with struggles of reason versus faith, the romantic versus the pragmatic, success and failure, the complications of relationships under pressure, and seeking understanding versus living with mystery. Daily readings present the Bible as a book struggling to make sense of life, rather than a book of absolute answers, but finding meaning in the face of mystery via the paradox of humility and trust before God. It is designed to be studied by groups or individuals alongside the DVD of the movie. Each session includes the timing of the extract from the DVD, group discussion questions and a meditiation. There are also short introductory and follow up chapters for individual reading each week, and a chapter of Bible passages for further daily reading. The Mystery of Everything and Theory of Everything DVD Value Pack was published by Eden bundles in January 2016 and is our 7957th best seller. 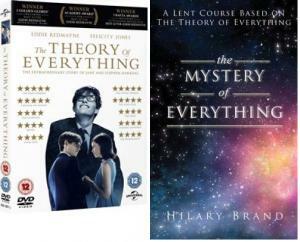 The ISBN for The Mystery of Everything and Theory of Everything DVD Value Pack is EDENBUNDLE-1709. Be the first to review The Mystery of Everything and Theory of Everything DVD Value Pack! Got a question? No problem! Just click here to ask us about The Mystery of Everything and Theory of Everything DVD Value Pack.